September is the height of tailgating season. It's also National Chicken Month. Chef Mandy Cullen from Nourishment Personal Chef Service shares some great recipes to celebrate. 2. Combine all ingredients, mixing well. 3. Spoon into shallow 1-quart baking dish. 4. Bake 20 minutes or until mixture is heated through; stir. 5. Serve warm with tortilla chips and veggies. 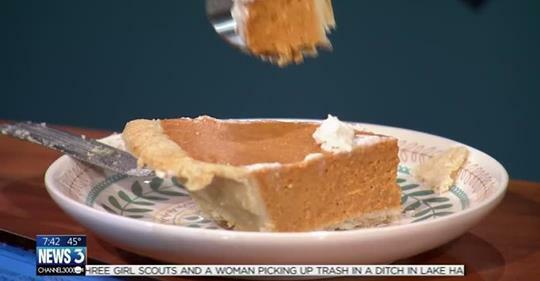 Chef Mandy Cullen from Nourishment stops by News 3 to share a recipe for pumpkin cheesecake pie that’s perfect for your holiday dinner table. 2. Mix softened cream cheese and condensed milk together until smooth. 3. Stir in the pumpkin, eggs, and pumpkin pie spice. Mix until well combined. 4. Pour batter into 2 pie shells. 5. Place on a foil-lined baking sheet and bake for 45 minutes. 6. If the crusts brown too quickly, simply place foil over the edges to prevent burning. 7. Pie is done when a knife inserted 1 inch from the edge comes out clean.